It's time for the new release of The Cat's Pajama Stamps and a new TCPTUES338 - How does your garden grow? AND to add to that fun, it's the TCP Blog Hop! If you arrived from the talented Brenda's blog, then you are in the right place. There is so much fun with this release and one that will surely please most everyone. Flowers, gnomes, and sentiments oh my! The Cat Pack has been busy creating some fabulous projects highlighting these awesome sets. 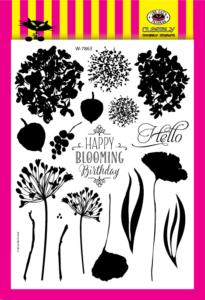 I shared with you all yesterday the wonderful Big Blooms set and today I am sharing with you a card made with What's Up Gnomies? I wanted to create a window type card with some acetate to have the flower peek through as the rest of the scene was on the outside. Using some fun patterned paper from Doodlebug & Co, I made the cover with the acetate between the cardstock base and the patterned paper. I stamped and colored the images with Copics before fussy cutting them out to be popped up on the front. I stamped the flower on a white panel to be colored in and some clear Smooches glitter pen added to the petals. I finished the card with some rhinestones as the "water" falling from the can and the sentiment partially stamped on the outside and the remainder on the inside. Now - ARE YOU IN IT TO WIN IT? All you have to do is leave a comment and a random winner will be chosen to win a $10 Gift Certificate to the TCP Store. The winner will be posted on the TCP Blog. Now be sure to hop on over to my other awesome team mate Nancy's blog for some more wonderful and talented inspiration. Thanks for popping in and hope you have a great day! It's a fabulous day for some sneaky peeks of some super fun sets to be released Tuesday for The Cat's Pajamas! There is a fabulous floral set, Big Blooms, being released that has hydrangeas and a stamp that can be used as either grapes or my favorite - Wisteria. I have two cards to share with you showcasing this set along with a super fun Ribbon Banners die and Banner Day sentiment set. For this card, I created a scene on watercolor paper so that I could stamp the images in color, restamp them in Versamark to be heat embossed in clear. I created the leaves of the wisteria using the hydrangea stamp and adding the wisteria throughout. Then I ran some yellow distress ink and water to the top and ran it towards the bottom for a wash. I wiped off the excess before stamping the simple sentiment and finishing it with a few thin strips of cardstock and pearls. My second card is another watercolor card that I used different distress ink colors to create the background before stamping the images in the center. I used the Ribbon Banner die to cut out the banner with vellum and heat emboss the sentiment in black. The card was finished with a few rhinestones and I went over the flowers with my Wink of Stella pen for added sparkle. There is an adorable Gnome set being released that you can take a peek at tomorrow so be sure to check back! In the meantime, ARE YOU IN IT TO WIN IT?! All you have to do is leave a comment to be entered to win a $10 TCP Store gift certificate! That's it! The winner will be announced on the TCP Blog. Again, come back tomorrow for our blog hop to see all the fabulous creations the Cat Pack have put together and for the new TCPTUES challenge!! Today is Your Next Stamp's Feature Day and it is about making your own background with stamps. Back before you had beautiful patterned paper companies, you found yourself making your backgrounds with the stamps you had. It's always a great way to pair your stamps together or just tie in the look of your project. I decided to make 3 small 4x4 cards using Sweet Little Greetings. This set is perfect for not only making multiple cards for giving but also great to make your own backgrounds. This set is adorable and I love using it for quick gift cards or tags. It is a perfect size. For these three cards, I used the stitched square dies for the center sentiment panels. After creating the background, I popped up the sentiments and finished two of the cards with some gumdrops. I heat embossed the flower on the Get Well card and placed a piece of twill ribbon on the side. 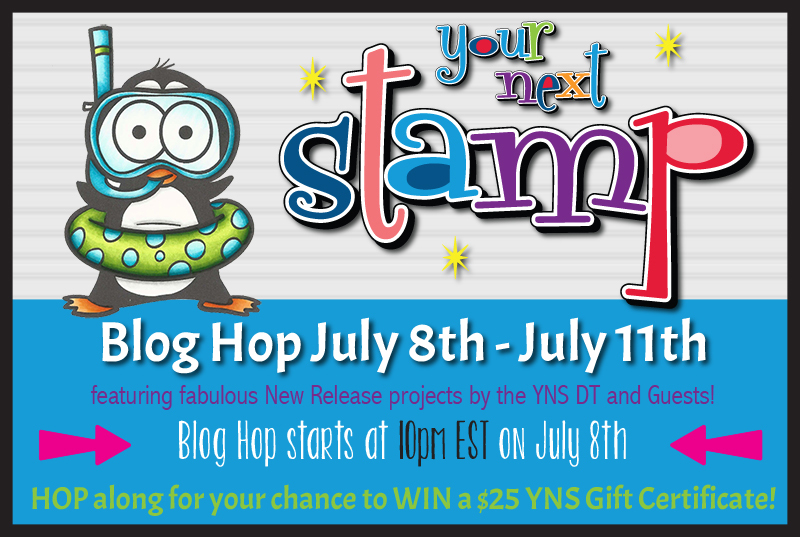 Be sure to check out all the fabulous creations the DT have done on the YNS blog and while you are there, be sure to leave a little love for your chance to win a stamp set of your choice! Thanks for stopping by and hope you have a great weekend! This week was a busy one for me and my family as we spent it at West Point Military Academy. My son was doing their lacrosse camp and he had a great time! He learned a lot, met new friends, and his team came in 3rd overall. My other son stayed with a friend, so hubby and I took advantage of this time alone to explore the area and just spend time together. It was a nice time overall. It is Friday and it is time for another Your Next Stamp sketch and/or color challenge. I know I always say the sketch is so much fun, but really- this week's sketch is super fun with multiple options for you to have a take on it. For my card, I chose to make a masculine CAS card using Whatnot Sentiments 9 and some patterned paper from the YNS collection of For the Boys. 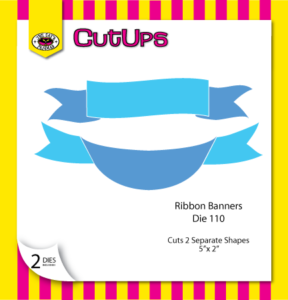 There are many fabulous sentiments in this set which helps when you are making 10-minute cards or a CAS like this. I started with a Kraft base and used an off white panel for the main layer before adding the patterned paper an sentiment layer which is popped up. The card was finished with some gumdrops. Easy peasy! Be sure to stop by the YNS blog to see the other DT creations to get your weekend mojo flowing! Thanks for popping in hope you have a great weekend! It's a Your Next Stamp DT Dare and this month's theme is It's a Guy Thing. And with that theme, I couldn't resist making another hidden slider card using the ever cute Snorkel Fun Fishy. This is such a cute set, but the whole snorkel collection is so much fun. I don't know why the eyes under the mask make me giggle but they do and I always have to use some Glossy Accents on it. I stamped, cut out and attached some of the bubbles to the top of his snorkel and stamped some bubbles next to him. The card was finished with some glossy accents and some YNS Crystal clear and sparkly gumdrops. The sun is from the YNS Whatnot seasons die collection, but I believe that may have retired. 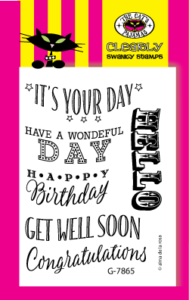 A super fun card to make and it is sure to put a smile on someone's face. Thanks for stopping by and don't forget to stop by the YNS Blog to see all the DT creations and to leave a little love. You can win a stamp set of your choice! Who wouldn't want that?! Make it a great day! It's time for the July re-release blog hop with Your Next Stamp. As I mentioned before, there is no new release for the month due to YNS moving to a new home, but we are showcasing some fun sets YNS has to offer. There is, a new paper collection and two new gumdrops being offered this month. The paper collection is to die for! If you love plaids, you will love this collection of Summer Plaids. He is super fun to color and I decided to add some Glossy Accents to the water droplets. The image was stamped and colored in with Copics before using the coordinating die to cut him out to be popped up over the patterned paper. I finished the card with a few fun gumdrops for added sparkle. My second card is one made using the set of Acorn Fall Fun. Here is another super cute guy perfect for those belated birthdays or even to just say "oops!" 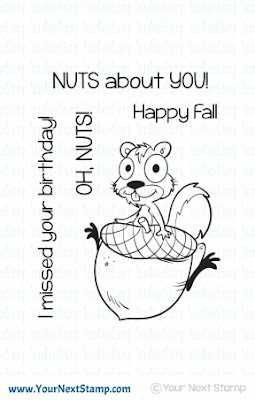 For this card, I added the inside sentiment of "I missed your birthday." The image was stamped and of course colored in with Copics and I fussy cut him out to be popped up. The edge of the papers was cut out using a wavy die and I used the Stick Frames die set as the background to the image. This card was also finished with some gumdrops. 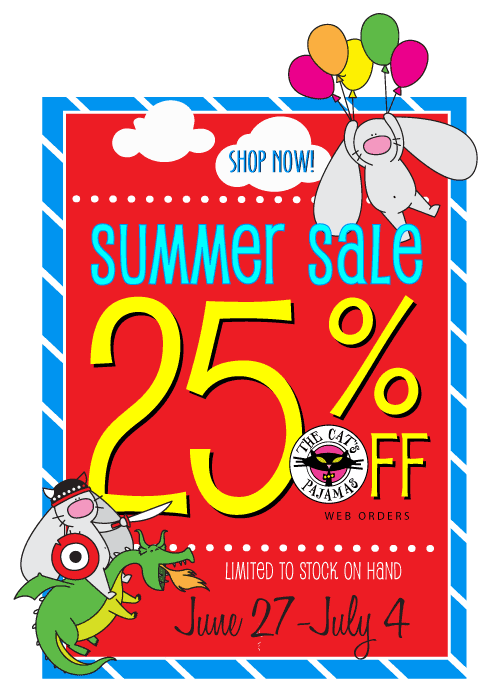 Of course, Karen couldn't get away without offering you all a fabulous sale this month! Come shop at the YNS Store and you can save 15% off your order!! 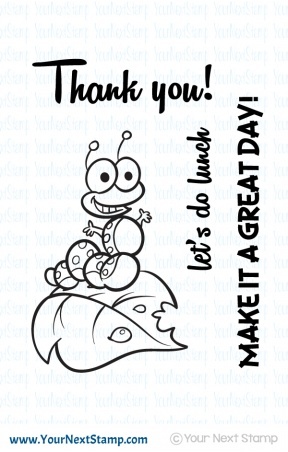 Thanks so much for hopping in and don't forget to leave a little love along the way of the hop for your chance to win a $25 YNS Gift Certificate! It is that time when we are usually celebrating a new release here at Your Next Stamp, but this month we are doing a re-release. 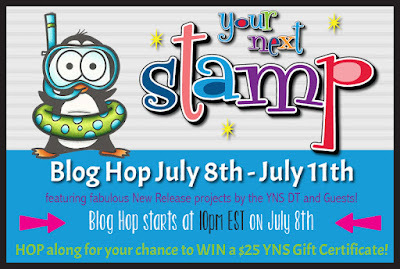 Karen and the Your Next Stamp home are moving to a new place, so the DT is focusing on a few super fun sets the YNS Store currently has. Don't fret! Karen is still offering a fab sale, prizes to be won, and of course, we will be having the usual blog hop showcasing all the fun sets the DT chose. Be sure to head back over tonight for the start of the July blog hop.To start, we are focusing on the theme It's a Girl Thing. My card today is one using the Snorkel Fun Penguin set. This little guy is so cute and is so much fun to create with. I couldn't resist making a hidden slider card using the large spinner/slider die set in the YNS Store. Thanks for stopping by here and be sure to stop by the YNS blog to see all the creations and to leave a little love so that you may have a chance to win! And again, don't forget to stop back tonight for a fun re-release blog hop for July! Have a great Saturday! It's a new sketch and color challenge over on the YNS Blog! So many options to create something with the simple sketch and perfect for many sentiment stamps. For my card, I used a few of the colors and the sketch to use the Whatnot Sentiment Ten set. The newly release paper collection of Tropical Island was perfect to showcase along with it. Using the coordinating die set, I cut out the words to place them at the top and bottom while using the butterflies as accent bits. The card was completed with some fun Frosted Gumdrops. Easy peasy and a perfect sketch to create a 10-minute card. We hope you play along and link up for your chance to win! Thanks for stopping by and be sure to check out the other fabulous creations some of the DT members made. Have a great Friday!